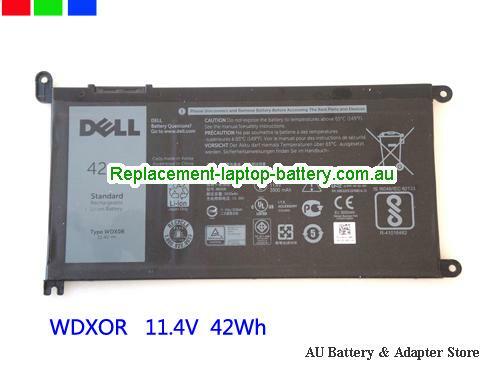 New and high quality Dell WDX0R WDXOR Battery For Inspiron 15 7000 Series(Li-ion 11.4V 42Wh) In Australia. Step 1: Make sure customer bought the correct battery. Step 2: Check battery's appearance and interface. Step 3: Test battery charger and recharger function. Step 5: Use Ev2300 to check the voltage difference of each goroup cells. Step 6: Charger battery power more than 30%. How can i sure this Dell WDX0R WDXOR Battery For Inspiron 15 7000 Series is the correct one i need? My original laptop battery is most the same as the picture in this page. It can compatible the battery number of my original battery. It is show clearly this battery can fit my laptop model. (Not Necessary). How can i do when i didn't find my laptop model listed here? Tell us your laptop model when fill the shipping informaiton in the shoppping cart. Other usefull knowledge for find a correct Dell laptop battery. Battery OutPut Volt : 10.8v and 11.1v, 14.4v and 14.8v can compatible each other. Tell us your laptop model and the battery number when you fill the shipping information will help you get a correct item. .
1. How long should a laptop battery be charged? You can’t overcharge a laptop, the charger’s or laptop’s charge control system will make sure of that. So you can leave the laptop hooked up to the charger all the time when that is practical. Keeping the laptop plugged in while you use it will also maximize the long term life of the machines expensive to replace batteries. To get the longest run time from the laptop when you can’t be plugged in, fully charge the battery any time you can. The laptop will tell you when it is fully charged, usually with a simple light that comes on or turns from amber to green when the charging is complete. 2. Why is my Laptop battery self discharging? If you are not using your laptop i.e. it is turned off, battery will keep on discharging. This is what you call stand by timing of a battery. New batteries can withstand 8–10 days without usage (as obviously they can store more charge) and old laptop batteries will discharge soon in 1–3 days (as their charge storing capacity is already less). The discharge happens due to the internal chemical reactions in the battery. In the older batteries, these reactions are more powerful that they discharge the battery so rapidly. One thing you can do to avoid this is do not place your laptop in places with high temperature. It will increase the discharge rate. 3. What is the best way to keep a laptop battery healthy when the laptop is plugged in all day? Most batteries have built in battery management electronics that allow balanced charging and most systems will have a battery manager that allows you to select for maximum battery life either through software or on-board electronics and firmware. One thing that degrades batteries pretty fast is heat. ensure good ventilation ( don’t keep the laptop on your mattress or your lap ) and don’t leave the laptop in a hot car or in direct sunlight for extended periods. Avoid deep discharging the battery and switch to mains as soon as you hit 25 % or so. Some battery managers allow you to limit maximum charge to 70 % to extend battery life but you will have to deal with the reduced runtime when you cannot charge it. For example MY precision 7710 has a utility called the Dell Command - Power manager that will reduce the charging cycle to one time per day and restrict maximum charge to 70 % or so to prolong battery life. Check your laptop manufacturers recommendations and also laptop forums for more information. If your System manufacturer does not support advanced charge routines, unless you want to pull out your batter at 60 % and store it to extend its life, there isn't much you can do to retain full capacity beyond a few initial months. If you are prepared to pull the battery and run off mains supply, why bother about the battery life ? 4. Is it OK to use our laptop when it is charging? Does it kill the laptop battery? It's totally fine. The only thing that wears the battery is using it. If the laptop is plugged in, you aren't using the battery, so you're reducing wear on the laptop. People have a lot of crazy ideas about how to make their batteries last longer. It's all nonsense. Laptops use lithium ion batteries that work exactly as you would expect. Keep the battery charged, avoid using the battery when you could be plugged in, and quit worrying about it. Anything you do will have a tiny tiny effect on the overall life of your battery. Older types of batteries like lead acid (car batteries) or nickel metal hydride do have some weird properties to accommodate. For example, someone told me that laptop batteries wear out by being drained all the way. That's lead acid batteries. Not true for laptops. You might also hear about “memory” of the battery, where the first time you use it you have to charge it all the way up, then drain it all the way. That's nickel metal hydride. Not true at all for laptops.